KIEV, October 17. /TASS/. Ukrainian President Pyotr Poroshenko has expressed condolences over the explosion at the Kerch Polytechnic College, his press service said on Wednesday. "Why is it important for us? Because they are Ukrainian citizens. Certainly, when Ukrainian citizens are killed, wherever it could happen, it is a tragedy," Poroshenko was cited as saying by his press service which added that "the president offered sympathy to the Ukrainians who lost children, friends and relatives." 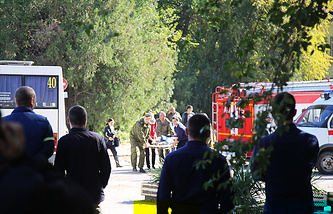 On Wednesday afternoon, a student of the Kerch Polytechnic College opened fire on those in the college and detonated an explosive device inside. Afterwards, he took his own life. According to the latest reports, 19 people were killed. The investigation opened earlier over an act of terror was reclassified as a murder case. On 16 March 2014, more than 82% of Crimea’s electorate took part in the referendum, when 96.77% in the Republic of Crimea and 95.6% in the Black Sea naval port of Sevastopol backed splitting from Ukraine and spoke in favor of reuniting with Russia. On March 18, President Vladimir Putin signed the treaty on Crimea’s reunification with Russia. Russia’s Federal Assembly (parliament) approved the document on March 21. Despite convincing results of the referendum, Kiev refused to recognize the referendum was legitimate.